The aim of the Norwegian Section like most M.R.E.S. 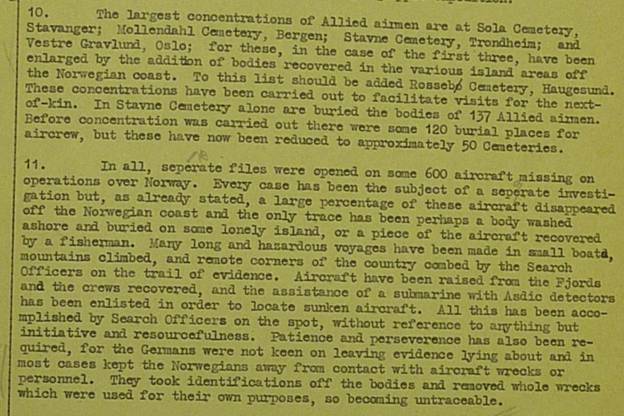 sections, was to try and locate all missing Allied aircrew and aircraft which had been lost over and off the coast of Norway during the war. Alternatively, to try and find some facts concerning the fate of these airmen, missing, believed killed, in order that details could be passed on to next–of–kin. 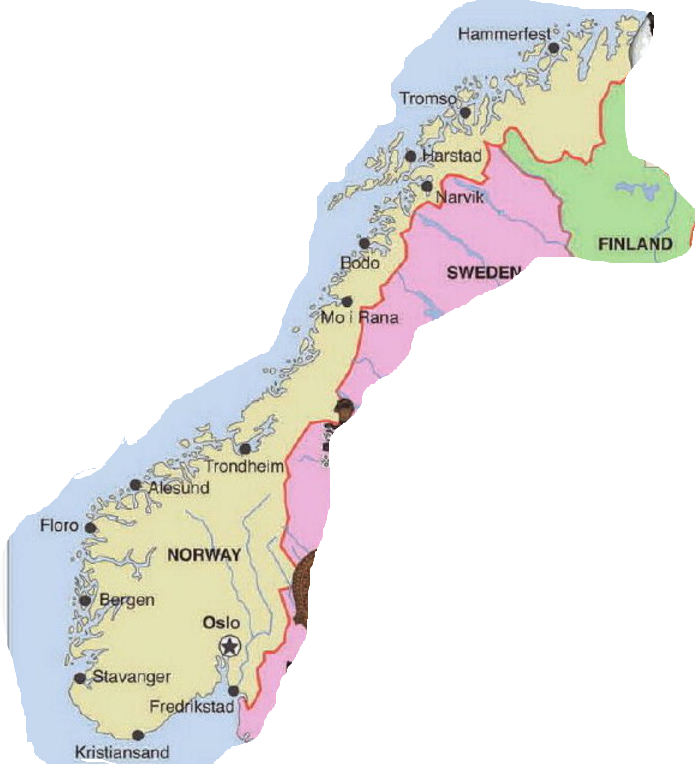 The cached document The Formation and Activities of Missing Research and Enquiry Service in Norway summarizes the operation of the MRES in Norway. As with most organizations there was some politics initially with 88 Group HQ also situated in Oslo which was supposed to provide both accommodation and transport for the MRES but which consistently failed to give adequate support. The MRES team managed to cobble things together but this lack of co–operation hindered initial progress. As I had found out earlier in the year, there was plenty of work to occupy the Norwegian MRES around Oslo, through Kristiansand and Stavanger to Bergen. The stretch from Kristiansand to Bergen proved to be the most profitable area in Norway then thinning out a bit north of Trondheim, but continuing right around to the Russian border. This was due to the large proportion of aircraft losses as a result of anti–shipping strikes. In a great number of these cases the aircraft and crew have disappeared into the sea and have never been recovered. The losses were borne mostly by 18 Group – Coastal Command; 38 Group, on supply dropping missions; and Bomber Command and with attacks on the "Tirpitz", bombing aerodromes and factories. The cases proved difficult owing to the remoteness from civilization of these crashes. Further, with the mountainous terrain of Norway with ever–moving glaciers, spring thaws and mountain streams; a body could be transported considerable distances after death. Road transportation was a real problem for at least 2 reasons. Even before winter (November to April) set in to make the roads impassable, Norwegian roads at that point in time were somewhat unique. Unlike in any other country, the roads were very tricky, being of poor surface, narrow, winding and steep. Except for in Oslo, it was difficult to average more than 22 m.p.g. . Next the type of vehicles assigned to the unit, Chevrolet Utilities eventually loaned from 88 Group were not always suitable for the operation at hand. Gas for the vehicles was drawn from any British unit still in the district or, failing that, from any unsuspecting Norwegian unit. Often times we requisitioned ex–German cars or even Red Cross vehicles. I should mention that although the Air Ministry had anticipated that the section would have to stop work during the 1945/1946 winter months and move out of Norway, the Section, with considerable perseverance, continued our work right through the winter in conditions of extreme cold, snow, and covered many thousands of miles over dangerous ice covered roads. From the Norwegian Air Force we borrowed interpreters, sergeants so that the job could be tackled "properly". Although we had a very good and close working relationship with No. 38 G.R.U. who had their offices a few doors down from us in Oslo, they often didn’t have the manpower to support our exhumation efforts. Where it was necessary to do an exhumation, German labor proved to be the best, it being, in the true German style, thorough! we were now receiving answering to a circular letter that had been passed around to authorities such as the police, Lensmen (the equivalent to a sheriff or a mayor of a town or village) and the Milorg (a name derived from their war time Military Organization, the Norwegian underground movement). Also some answers had been received to advertisements in the papers and on the radio. The local response was not great but it was a start and eventually led to uncovering many more incidents. Further the normal Norwegian working hours of 9A.M. to 3 P.M. hindered information collection and follow–up.